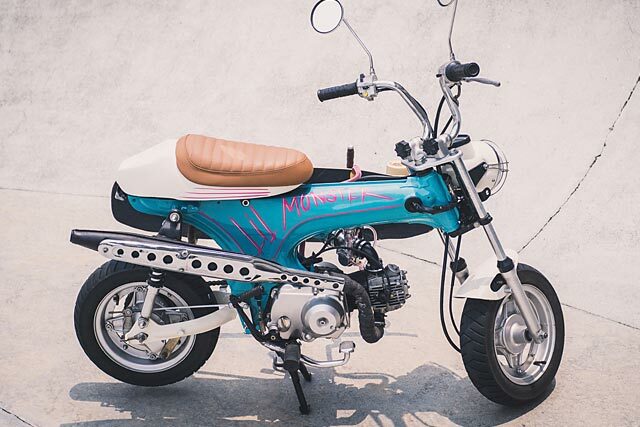 If at first, second and even third glance you thought the Comel was a Honda ST then you’re thinking what the lawyers of the big Japanese firm were when they first saw one too. The result was lawsuits right across Asia with many of Honda’s models having been reverse engineered and reproduced by dozens of small companies. But when the lawsuits failed, often with comical rulings, Honda saw the patent expire and markets were flooded with the cheap and cheerful knock offs. So it should come as no surprise that in the corner of the Beautiful Machines workshop sat such a bike, Julian from BM explains “So we had this little guy lying around in the workshop unused for some time. She was in a pretty decent condition so what we did initially was to get her spruced up and running again. 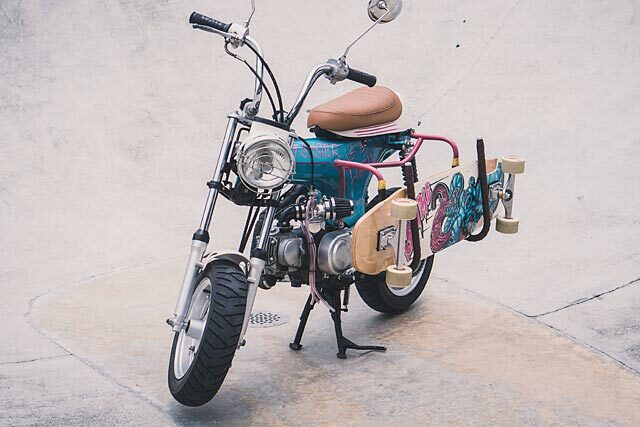 She then became our feeder bike at the shop that we used to get around the shop neighbourhood to get parts, takeaways etc.” But the little Honda copy had much bigger dreams. With the Art of Speed show fast approaching the LIL one came in for a full makeover and the idea was to present something totally different to the usual fare. Rather than the bad to the bone look that Beautiful Machines are known for this would all be about the fun side of life. The distinctive pressed steel T-bone frame was pulled down and body worked back to its best. 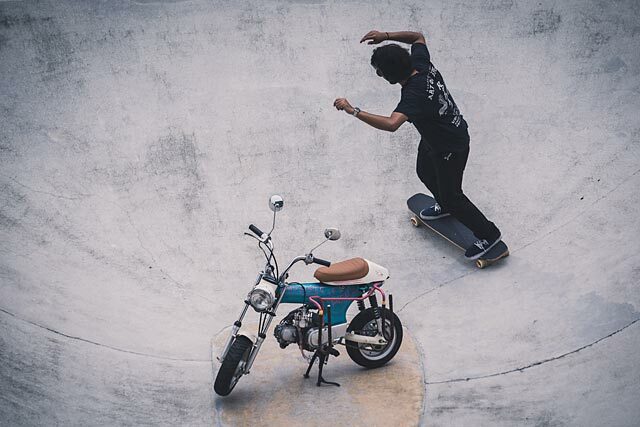 Then it was over to Ridwan from Slingshot Kustom Paint for a fresh vibe. 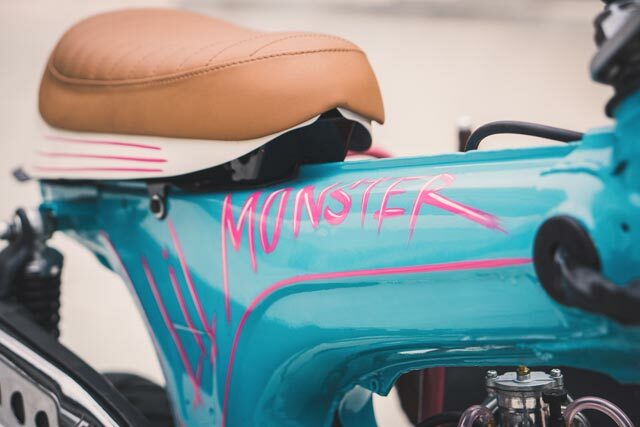 What he came up with is best described as bubblegum-esque with the main colour a bright cyan with hot pink and ivory to accompany it in the graphics and trim. It gives the tiny machine a big personality and you’ll never trip over it at night. 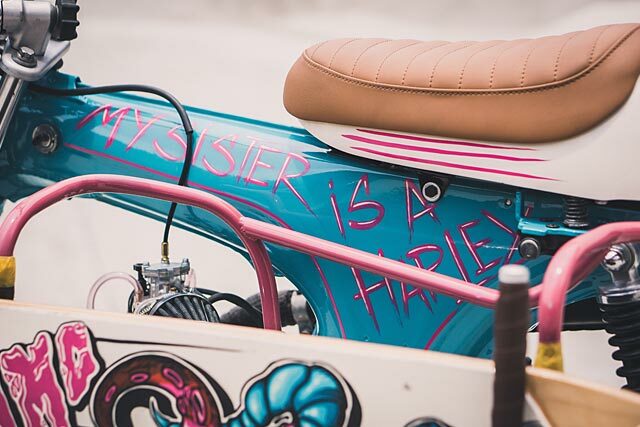 The new seat support was given the ivory treatment to break things up and more pinstriping in that popping pink. 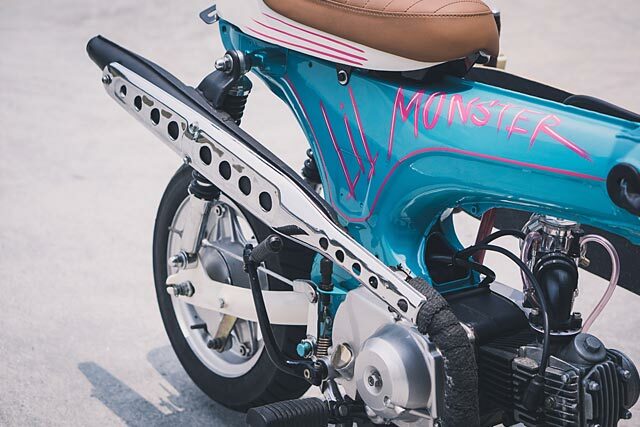 “As well as pinstriping Ridwan also painted her name ‘LIL MONSTER’ on one side of the frame and ‘MY SISTER IS A HARLEY on the other” an enthusiastic Julian explains, ensuring nobody forgets who this baby bike rolls with. 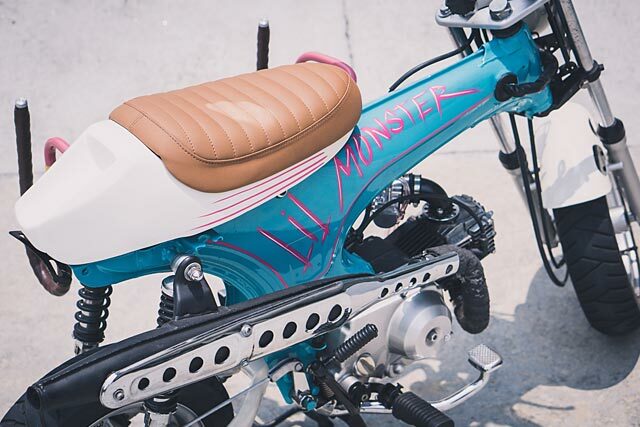 With LIL Monster now taking shape in the visual department it was time to make sure that she rode just as well. Of course unlike its companion it’ll never shred a tyre at the crack of the throttle but that’s no reason not to spice things up. 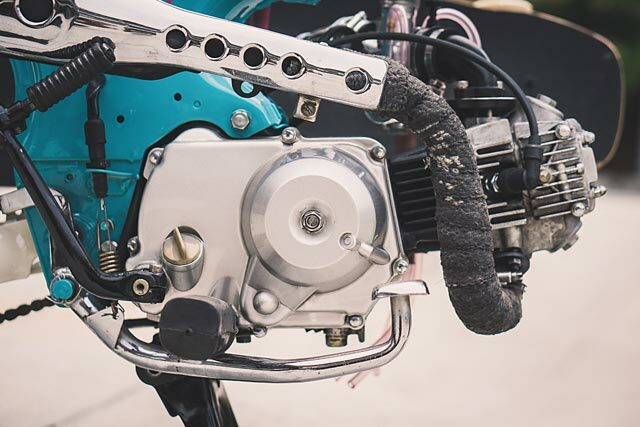 The small OHC single cylinder gets an all new air intake that mounts a bigger than stock generic carby with a small ram air filter. The stock header pipe gets an increase in size and some heat wrap to save any pipe burn on the compact machine. While a very neat new rear muffler section was fitted up for the classic Honda look and the cover re-chromed. Keeping things neat and tidy, as much of the electrics that the bike runs are hidden inside the frame underneath the seat. While the switchblocks were rubbed back of any paint to give them a more classic look and blend in with the bars. 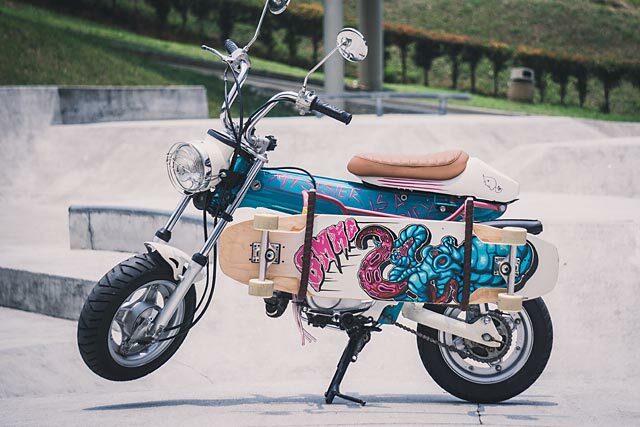 Those of course are the classic items that help give the Z designated Honda variant the Monkey bike name and they look just as cool on the Comel. 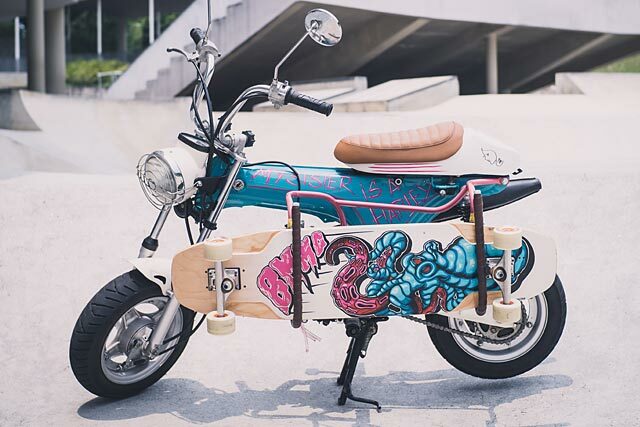 The full size mirrors, levers and grips all helping to accentuate the comical proportions of it all and you can’t help but smile. While a very cool little touch is the use of a classic headlight surround containing the old Honda speedo for that hint of Nostalgia. A new set of rear shocks, rebuilt front suspension and cleaned up wheels wrapped up in all new rubber finished out the build just in time. So while the shop Stallion ‘Monster’ has been travelling Asia, winning trophies at the biggest shows, always in the background is the much beloved companion. And for the fearsome reputation that many of the Beautiful Machines bikes have deservedly earned, sometimes its ok to have some fairy floss fun LIL Monster style and always remember never to take life too seriously, you won’t get out of it alive.